Today the Sun is in opposition to Mars which is a very energetic aspect to have and one that requires care in handling. If you think of Mars (planet of war and action) being opposite the Sun which is the core of the solar system then you get the general idea that things could go wrong today in a very big way OR they could go straight to plan with a few surprises that get you to your goal. One thing is for sure it is not a boring day. If you think of an opposition as 180 degrees with the Sun at one side and Mars at the other and imagine what you find in the middle… good old planet Earth where you reside then you get the gist of the energy around for you today. 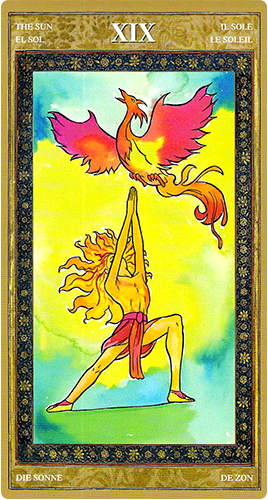 The card of the Sun for today’s tarotscope beautifully depicts the balance you will need today.Remember two feet on the ground, body open to the sun soaking up its rays and energy to enliven you and your hands pointing towards the heavens where a phoenix with a tail of fire seems to be laughing as it flies away from you. Do not let things get out of hand today as you may have a hard time reigning in what it is you want to happen and what is actually happening around you. Get very clear in your own mind what you need to do but don’t be so rigid that if something goes a little amiss then you are thrown into a state of panic because Mars could make that panic turn into something more than it actually needs to be… such as an explosive argument. Your feet are planted on the ground shown in this version of the Sun as the colour green which is a very grounding, practical and also the colour for new growth. Surrounding you is the energy of the Sun in brilliant yellow which is the colour of mental energy. The loincloth worn on the figure is the same colour as the phoenix which soars away from you across the sky. Hews of red, orange and yellow abound within the Phoenix which are the colours connected to the first, second and third chakras which all work from base energy. The first chakra is associated with Mars and there is a suggestion between the link between the pink of the loincloth and the same pink within the Phoenix that you can transform the raw energy around you today to accomplish something wonderful. I wonder what it will be? The card used for today’s tarotscope — The Sun — is part of the Yoga Tarot series, created by Massimiliano Filadoro, and Adriana Farina. Massimiliano Filadoro is an Italian author, writer and comic book artist. Adriana Farina is an illustrator, cartoonist, web designer and yoga teacher. This is a Lo Scarabeo deck published by Llewellyn.